I wasn't embarrassed to admit that I absolutely loved Gwenda Bond's first Lois Lane novel "Fallout" when it was released in May 2015. When I heard a follow-up book was being released in May this year, I was really looking forward to catching up with young Lois Lane, her teenage friends at the Scoop, and to see what mysteries she and SmallvilleGuy would be helping each other out with this time around. 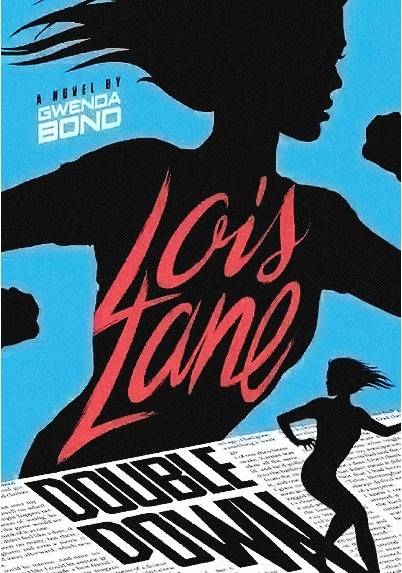 Gwenda Bond weaves an intricate tale of suspense, mystery and intrigue, mixed with a good blend of inter-personal relationships, all colored by Lois Lane's "can do" attitude. In "Double Down" Lois is well entrenched in her new school in Metropolis, she's building friendships (which she's still not sure she's good at), while trying to lock down what her relationship status is with her long-time online "friend" SmallvilleGuy. All the while she's investigating the mystery behind why her friend's twin is acting weirdly, how that's connected to the Mayor of Metropolis, and whether her own father is hunting down the "flying man" they both encountered years ago. I remember reading the synopsis released for "Lois Lane: Fallout" and being less than inspired. After I read that book, I was surprised at how good it was. Michael Bailey and I even interviewed Gwenda Bond on our live radio show "Radio KAL Live!" and discussed the book with her. She's a lovely lady who is a big fan of comic book characters and is only too happy to discuss them at length with fellow fans. I didn't get around to reading this second Lois Lane book until a few months after its release. In fact while I was only a few chapters in a press release announced that a third Lois Lane novel by Gwenda Bond would be released in May 2017. With the way "Double Down" ends, I'm extremely thankful that a third book is on the way. I can't wait to find out what happens next in Lois' life... Not just her relationship with SmallvilleGuy, but with the mysterious online identity known as TheInventor, who also signs his messages with the letter "A"... I have my theories on that one. "Double Down" is another enjoyable book in the Lois Lane series. While it is categorized as a Young Adult novel, I'd highly recommend it to anyone... especially Superman fans. It's one of those books you can't put down. You want to keep reading to find out what Lois is going to do next... and how she's going to get out of it. Purchase "Lois Lane: Double Down" from the Superman Homepage Online Store. If you haven't done so yet, also get the first book "Lois Lane: Fallout". You can also pre-order "Lois Lane: Triple Threat" ahead of its release in May 2017.